Located on Porter Street in the southeast part of San Francisco, this former Carriage House has a colorful past. Once a Speakeasy during Prohibition, it was later purchased and remodeled by a Merchant Marine who lovingly created an atmosphere reminiscent of a ship. Two units are available for rental. This a quiet location in a bustling city. 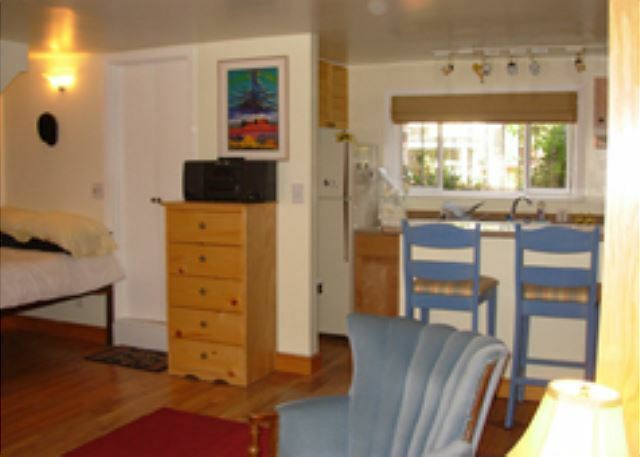 There is plenty of street parking in this area, no parking permits required and no restrictions on length of stay, once you park your car.This cozy bottom level studio apartment has new hardwood floors, a built in "captain's bunk" (double bed) and plenty of storage space. A very comfortable queen size Murphy Bed with new pillow-top mattress is also available in this unit. The bathroom has been completely remodeled with glass brick, tile and marble, allowing light to filter in. The newly renovated kitchen with granite counters and new cupboards, opens up to the living room and allows you to chat with your partner or guests as you prepare meals. The kitchen window looks out east upon a lovely garden and light filters through from both east and west facing windows. Everything you need to cook great meals is supplied, including spices! There is no shortage of closet and cupboard space in this unit. 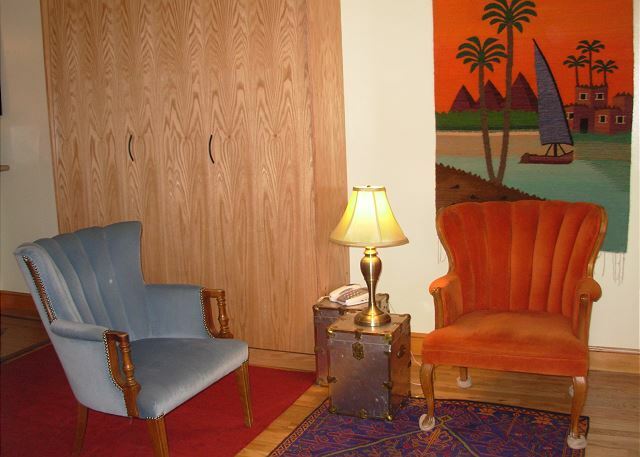 Antiques and new furnishings are found throughout the unit.Excellent nearby public transportation makes this ideal for those who are afraid to drive the steep hills and one-way streets of San Francisco. The #23 bus line is a few doors down and will take you to either Mission Street or the Glen Park Bart Station. 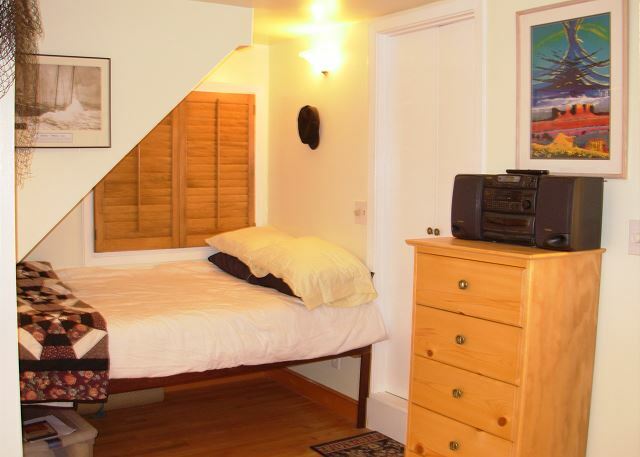 The Carriage House is located a 10 minute walk from Mission Street where you can catch buses to downtown and connect to just about any part of the city. Bernal Height's main shopping district, Cortland Avenue, is four blocks away (from the unit - right on Crescent, left on Andover) and contains numerous shops, restaurants, video stores, grocery stores, deli's, Laundromat, bank, bars, library and much more. Be sure to take a walk down Cortland and enjoy all this busy street has to offer. The #24 bus can be caught at Cortland and Andover; this bus will take you to Noe Valley, Castro and the Marina. The Farmer's Market is held on Saturday, just down the hill - farmers from the central valley come to sell their produce, flowers, herbs, chickens, seafood, honey, nuts and breads. Arrive early to buy the freshest ingredients. 30 night minimum. No smoking. No pets. No unauthorized guests. $100 water/utility allowance included, guests are responsible for overage. Prices do not include additional costs for interim cleaning, pet fees, additional guests, security damage insurance policy, and 3-5% processing fees (when applicable). Please inquire for an exact quote.